You’ve been lying to yourself about your partner. There’s an ever-widening gap between the person you want her/him to be and the person she/he really is. You have an idea of what constitutes a healthy relationship, yet you forgive your partner when she/he commits serious relationship grievances because, after all, she’s/he’s not all bad. It started out small, didn’t it? You caught her/him in a “minor” lie, but she had a somewhat reasonable explanation for it. When you put two and two together, her justification seemed sensible, so it changed from being a lie to a “slight misunderstanding”. Then, when it kept happening, she turned your attention away from the fact that she was lying to your being “suspicious, needy, and insecure”. So that when you’d catch her in another lie, she’d simply rage about your always watching her every move . When that got old, she began chalking up her bad behaviors to your having “let yourself go”. Suddenly, you were overweight, getting old, uninteresting, and a clingy basket case. Even worse, she claimed you’d become so “schizoid” that you weren’t good relationship material for anyone. And so you decided to stay instead of being alone because “she’s not all bad”. Now, out of a one-month period, you might have one or two “good” days while the rest of your time is spent in misery and complete disaster. You survive day-to-day, barely staying sane, hardly able to function (or take care of your children) while waiting for the rare occasion that she might be “nice”. Through all the tears, heartbreak, and sucking it up, you know she’s going to come around at some point because she’s just “a normal person who makes human mistakes”. Of course you haven’t been perfect because you’ve been emotionally traumatized. People who have been emotionally and psychologically abused typically display C-PTSD symptoms that can mimic bipolar disorder. Judith Herman, author of Trauma & Recovery, describes C-PTSD as a form of trauma associated with prolonged subjection to totalitarian control including emotional abuse, domestic violence or torture—all repeated traumas in which there is an actual or perceived inability for the victim to escape. This may cause difficulty in regulating one’s emotions, explosive anger, and changes in self-perception which include shame, guilt, and self-blame. All very devastating for someone who didn’t start out that way. I’ve been coaching people for a good while now and the people who come to me for help generally share a specific set of personality traits (based on data derived from informal personality assessments). While there are occasional deviations, most of my clients are INFJ (or generally Intuitive/Feeling), Empathic, and Highly Sensitive. Knowing what I know about these traits, the person who possesses them is very caring, nurturing, over-conscientious, and generally NICE. But sadly, they stop believing that about themselves because they’re in a persistent state of nuclear meltdown from being mistreated and manipulated by their toxic partner. If your partner is constantly lying, being cold and being unfaithful, it’s a warning flag of a serious personality disorder – one that cannot improve. When we forgive and accept their excuses for these behaviors, we inadvertently teach them to keep doing more of the same. Over time, we lose more and more of ourselves while teaching our children that these events are normal in relationships, romantic or otherwise…and perpetuate dysfunctional relationship dynamics in the process. 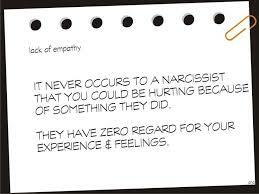 And therein lies the danger in believing the common fallacies we come to accept in toxic relationships. If you are accepting the unacceptable, are waiting for your partner to change, and experiencing cognitive dissonance via believing things will get better in the face of increasingly devastating emotional abuse, it’s critical that you go No Contact and get help before your C-PTSD symptoms get worse. Stand up for yourself. There are good people out there. Don’t continue sacrificing your morals and self-respect for people who aren’t.